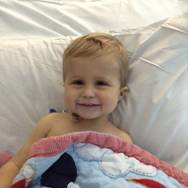 Four-year-old Freddie from Yorkshire, received a liver transplant in 2015. Freddie's mum said: “The worst of the diagnosis was, and still is, I can’t make Freddie better." "As a mummy you can always kiss every fall, cut, bruise and make it better. This is all I wanted to do." "Not having that as an option was hard… The wait for the transplant was absolute torture. I had totally underestimated how bad it would make me and his dad feel and the emotions we would run into." “The person who is responsible for Freddie’s gift left a legacy they will never have the honour of knowing about."